Situated on Portugal’s southern coast, the Zoomarine Algarve theme park is located in Guia, Albufeira. Perfect for families, Zoomarine is the home of beautiful beaches, colorful animal attractions, and heart-pounding water slides. This theme aquatic theme park opened its doors to the public in 1991. Zoomarine Algarve has become one of the most beloved tourist attractions in Portugal, receiving several awards throughout its years in operation. Families love visiting the Zoomarine Algarve theme park because of its thrilling water rides, relaxing beaches, and exciting shows. Guests of all ages find something to enjoy and learn at all the different attractions of the park. Zoomarine Beach – Guests to the park will enjoy the Zoomarine Algarve’s private beach. Visitors can luxuriate on the sandy shores, play with their families, or simply float on the ocean’s surface. Water Slides – Located near the beach, guests of all ages will also enjoy a variety of aqua tubes and body slides. Adrenaline-seekers and relaxed guests alike will find be able to find an experience that is right for them. Rapid River – In the style of popular amusement park rides, Zoomarine’s Rapid River provides a fun-filled trip through the rapids that will satisfy thrill-seeking guests. Zoomarine Pools – If the beach does not appeal to guests, they can head to the Zoomarine pools. Guests can relax and float in the regular swimming pool, but they can also find fun in the separate play area, which includes shallow pools and shooting fountains. The third area near the pools includes a full playground for children where they can splash, yell, and climb freely. Aquarium – Guests looking for direct contact with ocean life will love Zoomarine’s aquarium. Because of the facility’s wide range of fish and oceanic plants, visitors can learn about life on the ocean’s floor from within the theme park. With the help of park personnel, guests can even touch and interact with some of the creatures on display. Swim With Dolphins – If the aquarium still does not satisfy visitors’ desire to interact with sea creatures, they might prefer the Dolphins Emotions package. Guests will first watch a presentation that provides them with useful information about dolphins. 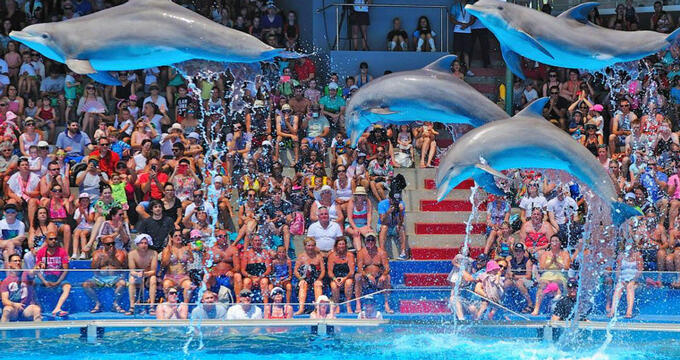 Then, with the help of a trainer, guests can actually swim and play with dolphins. One of the three programs even includes scuba training so that visitors can interact with dolphins underwater. Programs vary in privacy and length. Pirate Bay – Guests looking for a break from swimming will love Zoomarine’s Pirate Bay. This family-friendly show blends comedy, action, and fantasy, as actors perform stunts and acrobatic tricks. 4D Cinema – With the help of new technology, Zoomarine aims to give their guests an experience they will never forget in their 4D Cinema. Visitors can watch films that are both educational and entertaining about the ocean and its creatures, enhanced by added physical effects. Visitors with a sensitivity to strobe lights should contact Zoomarine Algarve in advance to ensure that they will receive the best experience possible. Animal Attractions – Animal lovers will find a slew of shows that highlight the natural beauty of the creatures for which Zoomarine Algarve cares. No matter their preference, guests can find something to enjoy, whether it’s the acrobatic dolphins, playful sea lions, majestic birds of prey, or brightly colored tropical birds. Zoomarine Algarve is committed to providing a wide range of educational opportunities to those who visit the park, aiming to better the environment through their efforts. Their sessions are available for school groups, as well as the general public. Droplets of Nature – This relaxed program provides visitors with an introduction to the basics of conservation, explaining how visitors can best protect the environment. Meet the Educator – At various locations throughout the park, guests can find personnel from the Educational Department. These guides welcome all types of questions from guests about the animals available within the park, as well as more broad inquiries about nature. Discover the Aquarium – This guided tour invites families into Zoomarine’s aquarium to explore the mysteries of the ocean. Guests can marvel at Zoomarine’s collection of fish and learn wacky facts about life under the sea. Ray Feeding Session – Visitors will appreciate the hands-on approach to learning that is provided by the Ray Feeding Session. With the help of park personnel, guests can learn about and eventually feed the park’s population of eagle rays. Zoomarine’s Guardians - This summer camp program is available for children of all ages. Guests stay at the park for a week, exploring the ocean, learning about the environment, and enjoying a collaborative, enjoyable experience that they will always remember. Field Trips – Zoomarine Algarve offers educational workshops free to Portuguese school groups. School groups can expect to tour the facilities, engage in conservation efforts, and gain important scientific knowledge. Although many of these programs are provided to any daily visitor, Zoomarine Algarve recommends that educators contact their educational department by phone or email to receive more specific information and plan their class’s field trip. Zoomarine Algarve does not offer many special events on its grounds, although guests are invited to rent out the facilities for weddings, parties, and other special occasions. The theme park does, however, host the annual International Marine Animal Trainers’ Association (IMATA) conference on its grounds each year. Animal trainers come to meet, learn, and enjoy themselves amidst the park’s gorgeous facilities. Seminars are offered in both Spanish and English, and interested guests can register IMATA’s website. Zoomarine Algarve provides the perfect dining experience for families; even the pickiest of guests will find something to enjoy between the various snack bars, kiosks, and restaurants featured at Zoomarine. Typical fare includes hamburgers, pizza, and other snack foods. There is also a picnic area, but outside food is limited to this area and may not be brought into restaurants. Throughout the park, visitors will find an assortment of souvenir shops. Guests can purchase gifts, souvenirs, and commemorative photos from their trip.